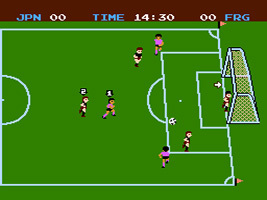 A NES soccer game. The aim is to get possession of the ball and kick it into the goal of the opponent's team. The winner is the team with the most goals when the time runs out. Choose from seven international teams, your skill level, and the time of the game.